Simple Questions. Simple Answers? Can God Forgive Me for Anything? Can God forgive me for anything? This is the final question in our short series, “Simple Questions. 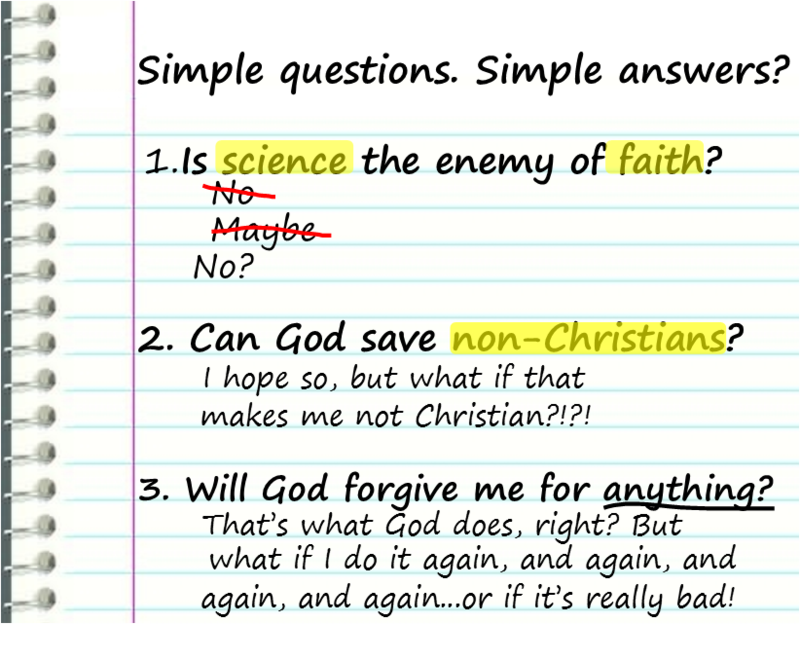 Simple Answers?” Our first two questions, “is science the enemy of faith?” and “can God save non-Christians?” dealt directly with misperceptions about Christian faith held by many people outside of the church. Today’s question does as well. Unfortunately, there are many people who believe that Christianity teaches about a punishing God. I God who is eternally vigilant in waiting for us to mess up so that God can quickly deliver punishment, or write it down on our divine scorecard to be used against us at a later date. It is also unfortunate that it is mostly Christians who have perpetuated the myth of God who is based on punishment. To be fair, there are definitely scripture passages that illustrate that there are punishing consequences for sin. If you remember Jesus story of Lazarus and the rich man in Luke 16. Lazarus was a poor man who suffered in his lifetime, while the rich man lived a life of luxury. After they both died, their fates were reversed and Lazarus was taken care of at Abraham’s side, and the rich man was in the torment of Hades. Then there’s Exodus, were God punishes the Pharaoh and the Egyptians for keeping the Hebrew people as slaves. But what Christians have done with passages like this is fixated on them and elevated them above the larger witness of Scripture which shows God is a loving, forgiving God. And so we have works like Dante’s Inferno, which is a book detailing the various circles of Hell and the punishment God has in store for each type of sinner. A more recent example that I witnessed, was when a group of us from Fairview marched in the Indy Pride Parade. We were there to let our LGBT neighbors know that they are loved by Fairview and by God, but at one point we marched by a group of Christians with signs condemning people who are gay and detailing the punishment that God had in store for them. But I think there’s a more important reason, today, and that is for us. And maybe more specifically for some of us. Can God Forgive Me for Anything? Simple Question, and the Simple Answer is yes. An absolute, unqualified yes. This is the fundamental bedrock of our faith. But the problem is, there may be someone here this morning who cannot believe this, you think it sounds too good to be true. Especially for you. Maybe there is something that you have done, something you think is so bad, something that hurt someone deeply, and you can’t imagine every being forgiven for it. You are unable to forgive yourself, and so you can’t imagine a loving and holy God being willing to forgive you. There was a movie in 1986 called The Mission. It was set in the 1700s and follows a Jesuit priest, Father Gabriel, as he works with a remote tribe in the jungles of Argentina. In this movie Robert DeNiro plays a slaver, Rodrigo Mendoza, who in the past has kidnapped members of this tribe to sell into slavery. He later repents of his actions and goes with Father Gabriel to work with the tribe he once enslaved. I wonder if that seems familiar to any of you. Are you carrying a burden that weighs you down? A burden of something you’ve done in the past that you can’t let go, that you can’t forgive yourself for, and certainly can’t imagine God ever forgiving you for? If so, I want to state again. Can God Forgive You for Anything? Yes. 100% yes. 2Early in the morning he came again to the temple. All the people came to him and he sat down and began to teach them. 3The scribes and the Pharisees brought a woman who had been caught in adultery; and making her stand before all of them, 4they said to him, ‘Teacher, this woman was caught in the very act of committing adultery. 5Now in the law Moses commanded us to stone such women. Now what do you say?’ 6They said this to test him, so that they might have some charge to bring against him. Jesus bent down and wrote with his finger on the ground. If you are someone who is holding on to something you think is unforgivable, then maybe you can relate to the woman in this story. Here she is, her sins exposed for all to bear witness to. Imagine the emotions she is feeling at this moment. Fear. Shame. Remorse. Imagine how she feels about herself. She feels like a sinner, unworthy. She knows what she has done. How can Jesus forgive her? These scribes and Pharisees have made clear to her what they think God has in store for her. She’s guilty. She knows it. She feels it. Now at this time, there’s really no historical evidence to suggest that stoning took place in situations like this. But certainly there would public judgment and punishment of some sort. And these scribes and Pharisees are looking to Jesus to condemn and punish. And they are appealing to Jewish scripture, our Old Testament, as the basis for their (and God’s) condemnation. But what they are conveniently overlooking, is the rich Old Testament and Jewish tradition of a forgiving God, of a God who from the very beginning acknowledges that we are sinners and makes plans and paths for forgiveness and reconciliation. The Bible shows us that forgiveness and mercy is fundamental to who God is. Let’s go way back to Genesis. Within the first four chapters, there are two egregious sins committed, and if any sin was unforgivable it might be these two. In Genesis chapter 2, the second creation story we find in the Bible, God creates Adam and Eve, God creates the Garden of Eden, God gives them everything they need and gives them free reign, except for one thing, right? God says, see that tree there, the tree of the knowledge of good and evil? Don’t eat from that. See all the other trees? Have at them! That tree, no. Everything else, all yours. God says, don’t do that thing, so what do they do? They do that thing? Then fairly quickly in Genesis and later more fully developed in Exodus and Leviticus, we have an ordained system of sacrifices as a way to repent for sin. A way to reconcile with God and be forgiven for sin. From the very beginning there is a strong message from God that says our relationship with God is not based on us being perfect, but forgiven. Our relationship with God is not based on whether or not we sin, because guess what, we will sin. We don’t have to be perfect, we aren’t perfect, just forgiven. We could learn a thing or two from Alcoholics Anonymous. What if I came up here and said, “Hi, my name is Shawn, and I’m a sinner,” and then shared with you my struggles with sin. And after me, someone from over here came forward and did the same thing. Just take a moment to imagine how you would feel as you walked forward with everyone’s eyes on you, stepped up to the microphone with a lump in your throat, and then looked out at everyone gathered here today and admitted to us that you were a sinner. I know I would find it a little scary and pretty intimidating. How about you? But, you know what? It shouldn’t be embarrassing. There’s no reason that anyone of us should be afraid or ashamed to admit our sinfulness to one another, because we are all sinners. Each and every one of us! This is why it is so important to answer the question, “Can God Forgive Me for Anything?” Because some of us know all to well that we are sinners, and the problem isn’t being honest about your sin, the problem is not being honest enough about the forgiveness God will grant. Oswald Chambers, in his devotional book My Utmost for His Highest, says that “Forgiveness is accepted, not earned.” Forgiveness is accepted, not earned. Let’s go back to John chapter 8. At the end of this passage, Jesus forgives this woman by pointing out that there is no one there to condemn her, including himself. She doesn’t ask for his forgiveness. She doesn’t repent. She doesn’t do anything but accept the forgiveness offered by God. Now I could certainly make an argument, that accepting God’s forgiveness can’t truly happen without some sort of remorse or repentance. But the forgiveness and mercy of God is there before we can truly grasp our need of it. Remember where we left slaver Rodrigo Mendoza literally carrying his burden of sin behind him? Let’s watch another clip that begins when he and his party meet the tribe that he had formally enslaved. Let’s watch what happens when they recognize him and the burden he is carrying. A young father and his daughter were on a cruise, a "get-away" cruise because his wife/her mother had just died. Turning to one another to help relieve the pain, they huddled together on board ship. And on the deck of that ship the little girl asked her father: "Daddy, does God love us as much as Mommy did?" At first, the father didn't know what to say. But he knew he couldn't side-step the question. Pointing out across the water to the most distant horizon, he said, "Honey, God's love reaches farther than you can see in that direction." Turning around he said, "And God's love reaches farther than you can see in that direction, too." And then the father looked up at the sky and said, "And God's love is higher than the sky, too." Finally he pointed down at the ocean and said, "And it's deeper than the ocean as well." Then the little girl said "Oh, just think, Daddy. We're right here in the middle of it all!" We are right in the middle of God’s love, wider, higher and deeper than we can ever imagine. Know that you are forgiven, for anything, and be at peace.